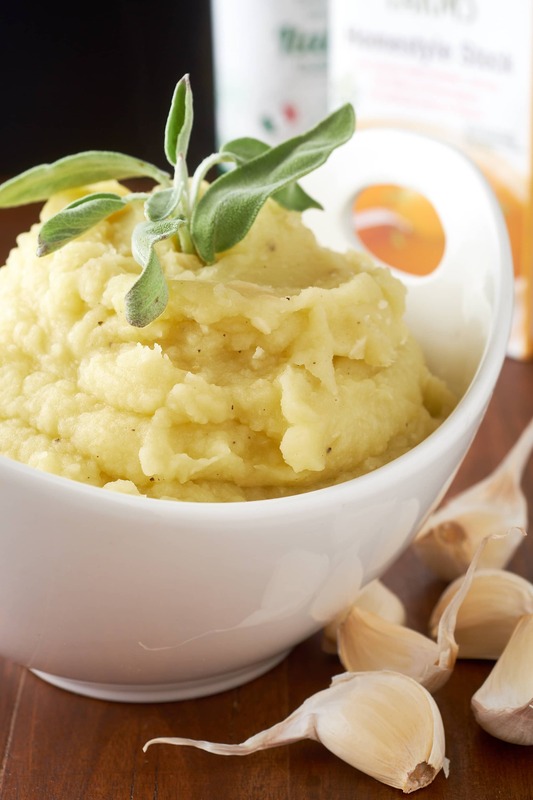 This recipe for Dairy Free Garlic & Olive Oil Mashed Potatoes with Chicken Stock sets out to prove tons of butter and milk aren’t mandatory for fluffy, delicious mashed potatoes. We can do this by over cooking the potatoes in chicken stock, letting them dry out before ricing them, then whisking in lots of garlic infused olive oil. I keep reading headlines like ‘how to avoid clumpy / gummy mashed potatoes’. I had to look in to what people were doing to understand how this was even a thing. 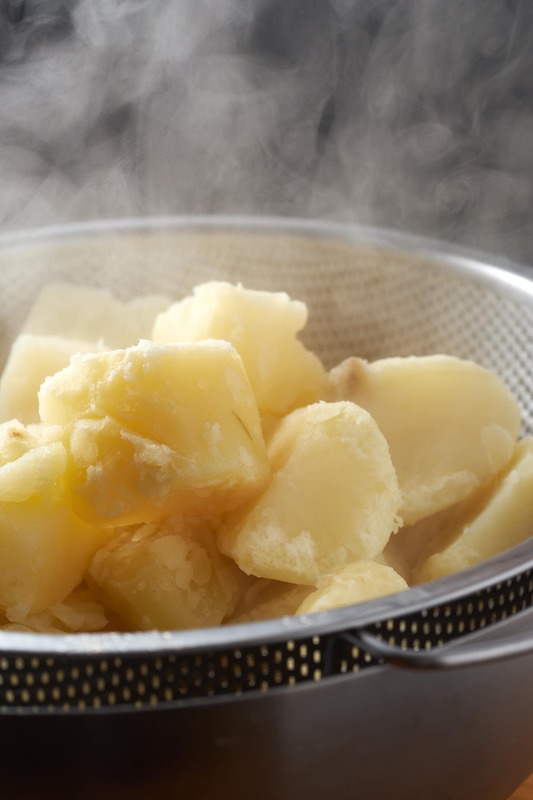 It seems like theses are some of the issues that attribute to less than perfect mashed potatoes – using the wrong potatoes, not letting them dry out, using cold dairy, using a machine to process them. Some articles suggest the solution is tons of butter and milk to make them silky smooth. I disagree. 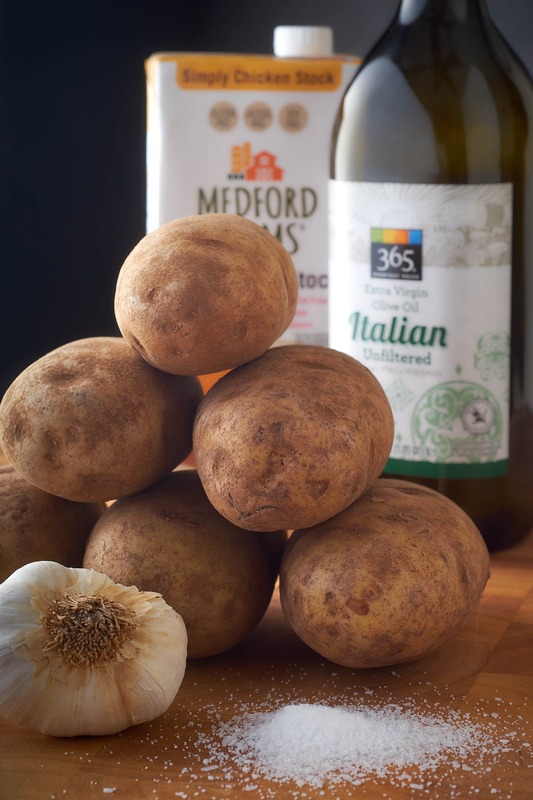 The correct potato is either the Idaho Russet or the Yukon Gold. Other waxy potatoes like White Boiling or Red Bliss don’t have the starch structure to whip up for maximum fluffiness. They’re best suited for boiling and roasting for potato salads or rustic smashed potatoes. Some similar options for mashed potatoes would be sweet potatoes or cauliflower but that’s a slightly different recipe. 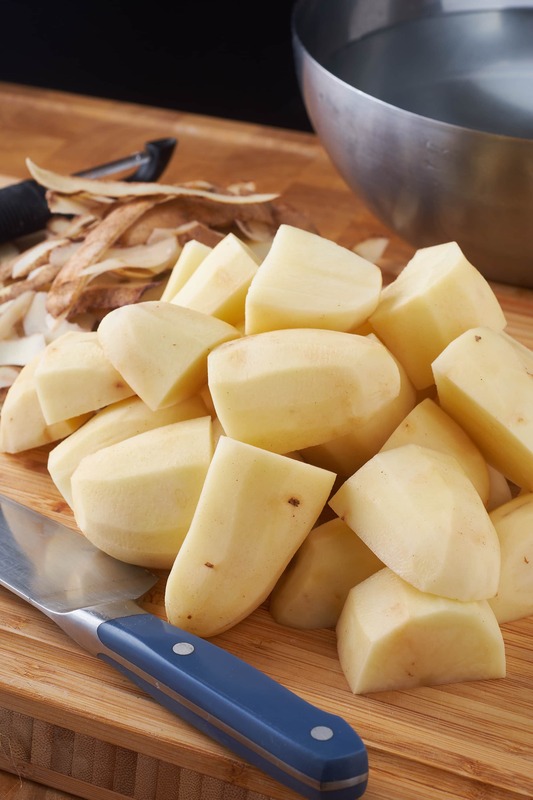 Peel then cut your potatoes in to equally sized pieces. Quickly rinse in cold water. Add to the pot and season with 1 tablespoon kosher salt. 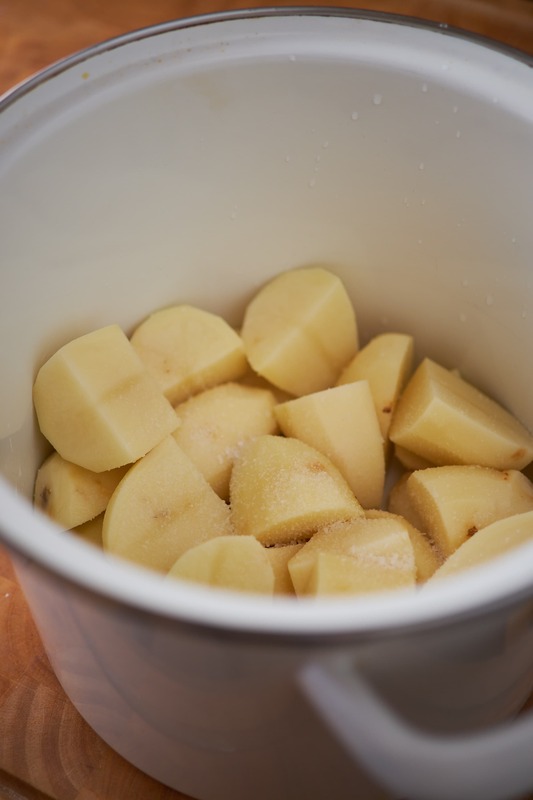 To cook the potatoes you’ll peel them then cut them in to equal sizes – roughly quartering the potato. I’m boiling them in a diluted chicken stock for added flavor. Using a vegan vegetable stock will make this a totally vegan recipe. 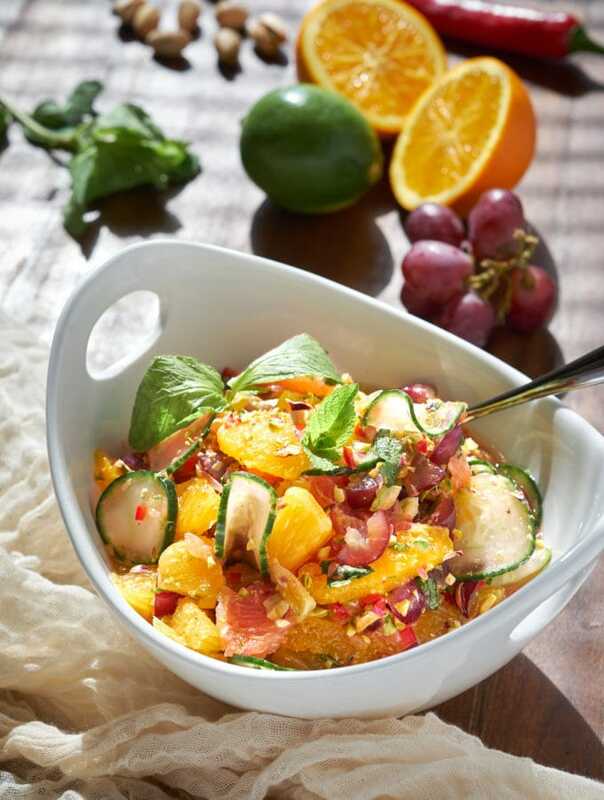 You could just use water or something else like white wine to infuse more flavor too. Be sure to overcook the potatoes. They should fall apart when you stick a sharp knife in to them. None of this ‘until nearly tender’ stuff. The key to a properly whipped potato is starting with a potato that nearly whips itself. Add 3 cups chicken stock and 6 cups water. Boil for 25-30 minutes until potatoes start to fall apart when poked with a knife. While the potatoes are cooking start the garlic infused olive oil. Add 1 1/2 cups olive oil to a small pot. Break apart one large head of garlic. 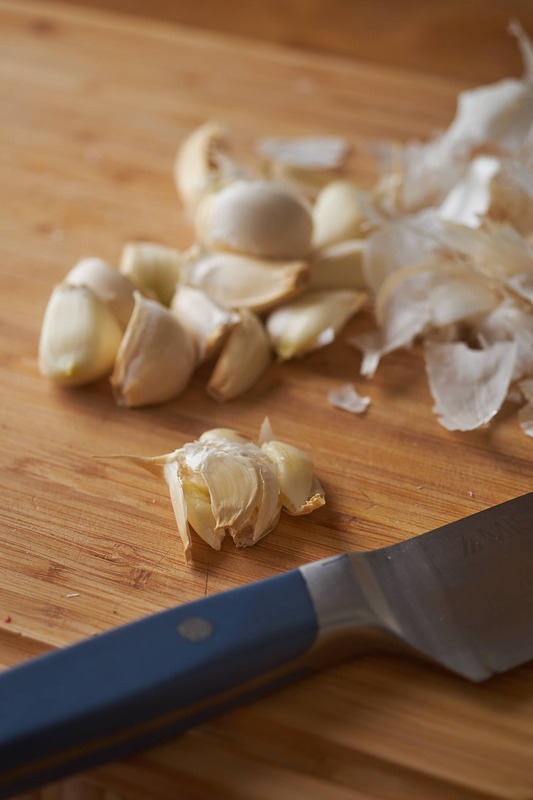 Smash and peel each piece of garlic with the flat side of your knife. 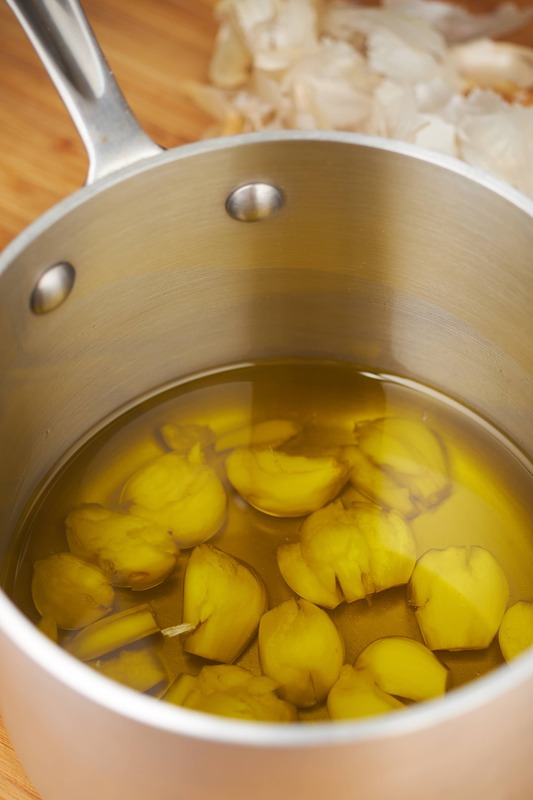 Smash all the garlic and add to a small pot with 1 1/2 cups olive oil. Slowly heat over a low flame for 20 minutes without browning the garlic. Once the potatoes are falling part, transfer to a colander to drain. Reserve 2 cups of the cooking liquid. 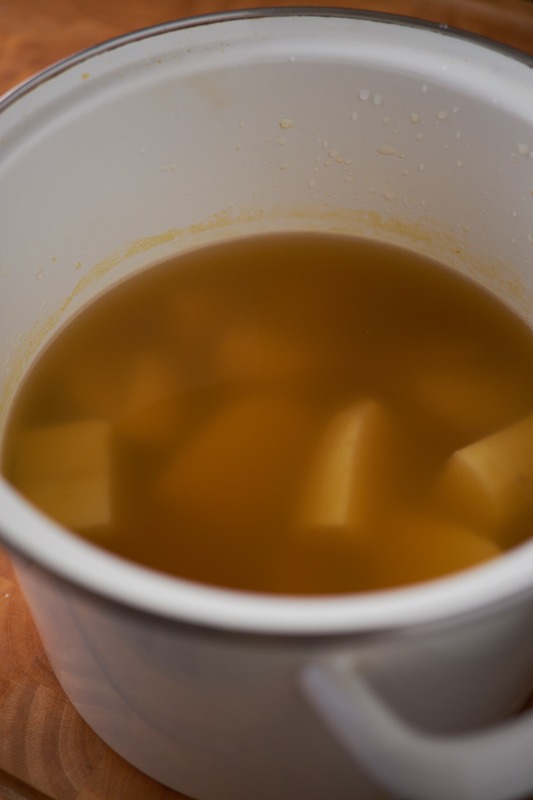 Once the potatoes are cooked beyond tender they need to be drained (reserving cooking liquid) and allowed to dry. In this recipe I drain then rice the potatoes back in to the original pot I boiled them in. Let a low heat cook off any remaining liquid in the pot for a minute or so. I highly suggest using a potato ricer for an extra silky result. A potato masher works fine too but requires a little more elbow grease. What you do not want to use is any sort of high speed blender or mixer. These machines rip apart the starch structures and over process the potato causing it to turn to glue – literally. 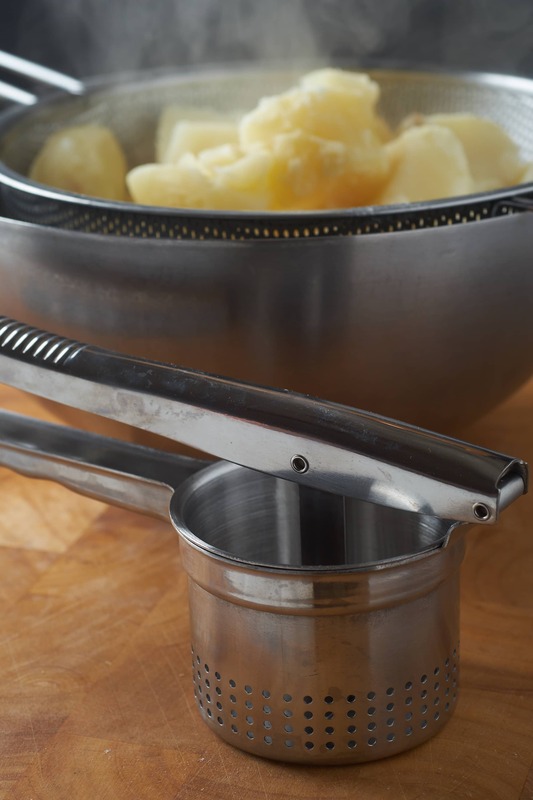 A potato ricer is ideal for mashed potatoes. You could also use a potato masher or a wooden spoon. Rice the potatoes back in to the emptied pot you cooked them in. Transfer to the stove top over a low flame to cook off any extra liquid for one minute. Whisk in the garlic and olive oil then add 2 cups of reserved cooking liquid. Season generously with salt and pepper. Now that we have some fluffy riced potatoes we can start adding the fat and liquid. If you’re going to use butter or milk for your mashed potatoes make sure they’re room temp or warmer. 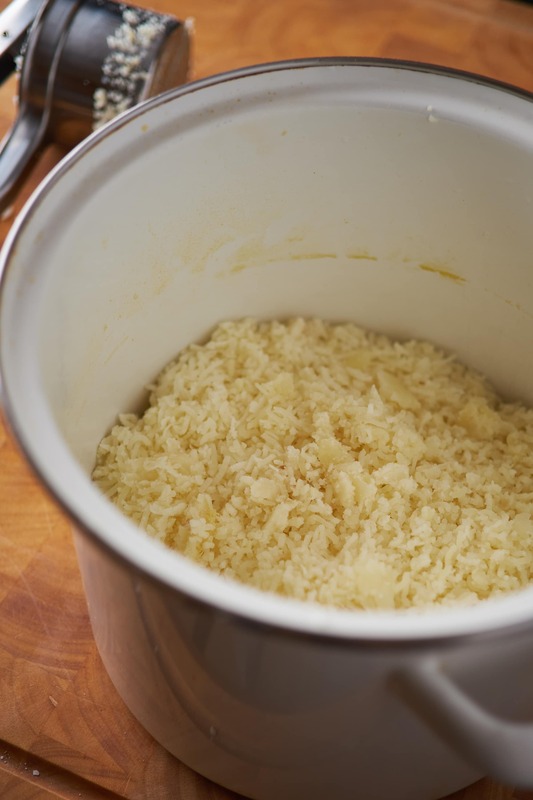 Adding cold dairy to the potatoes is going to seize up the starches resulting in clumps. Butter should be added a little bit at a time. You want to slowly emulsify the butter in with the potato as you whip it up. 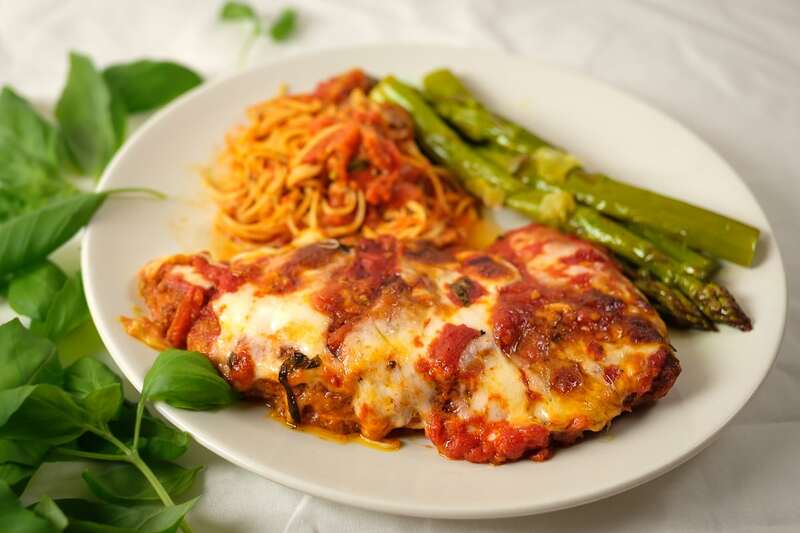 Instead of butter, this recipe uses one and a half cups of garlic infused olive oil. The oil can be added all at one time and whisked in with the potatoes. Once incorporated you can whisk in two cups of reserved cooking liquid. At this point you should have something that’s a little soupy but you’ll find it comes together quickly. 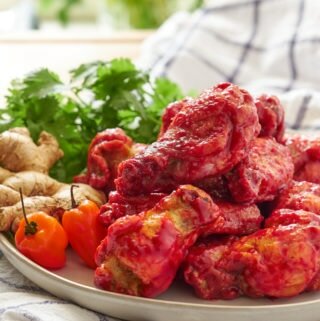 Taste and season well with salt and pepper. 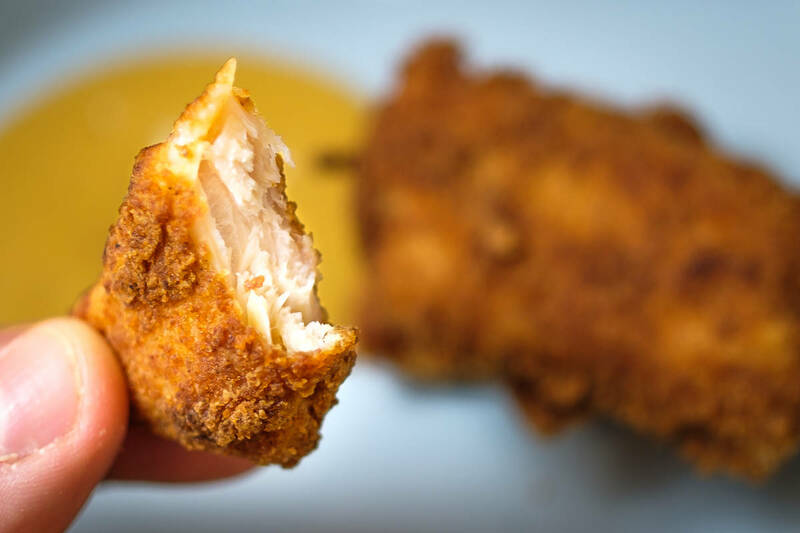 I used nearly a full tablespoon of kosher salt and about a teaspoon of coarsely ground black pepper. Mashed Potatoes are one of those things that has to be done a certain way in most homes. The way grandma made it, usually. I’m not convinced everyone’s entirely pleased with how grandma made it. 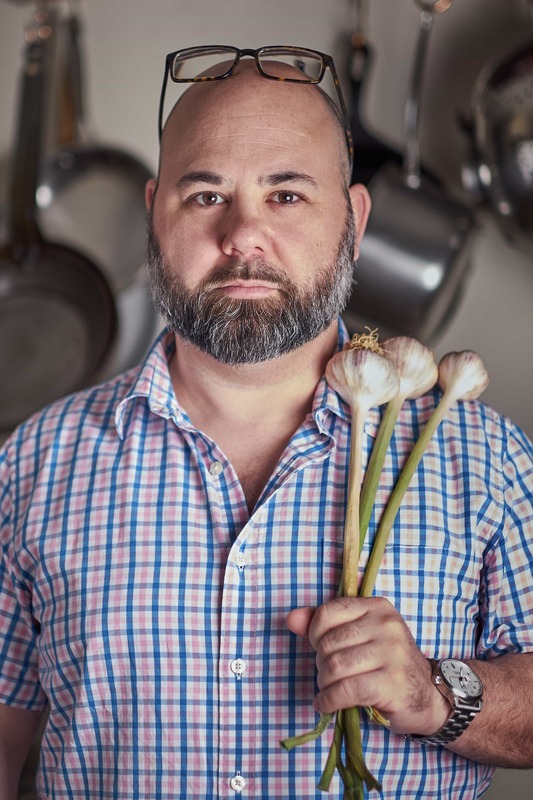 Recipes change over time. 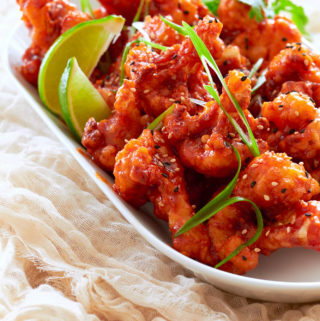 Dietary restrictions and eating healthier make us look for alternatives to classic recipes. I’m not suggesting butter isn’t delicious. 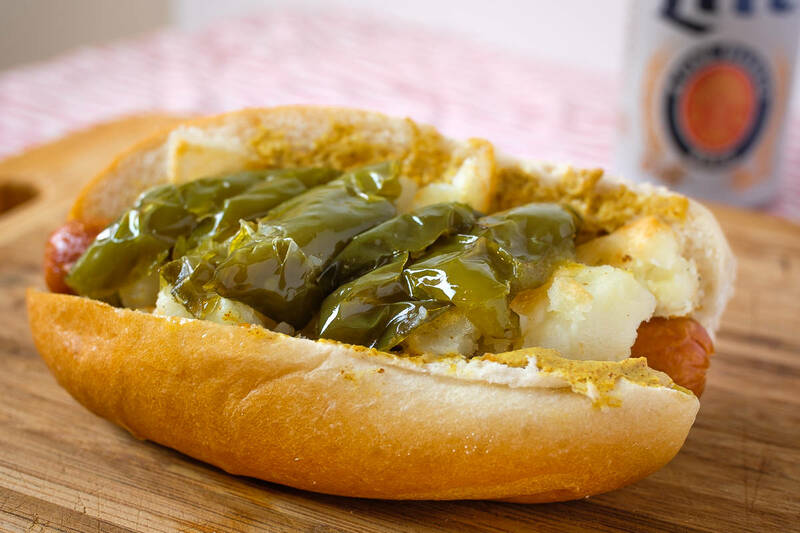 I’m offering an equally delicious alternative that I don’t think anyone would turn away at the Thanksgiving dinner table. 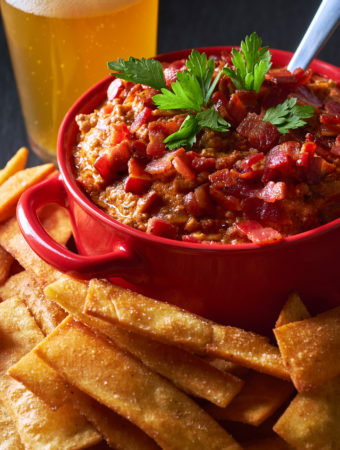 This is an easy recipe to try out and add to your repetoire. Give it a shot and let me know how you like it! This recipe for Dairy Free Garlic and Olive Oil Mashed Potatoes with Chicken Stock sets out to prove tons of butter and milk aren't mandatory for fluffy, delicious mashed potatoes. We can do this by overcooking the potatoes in chicken stock, letting them dry out before ricing them, then whisking in lots of garlic infused olive oil. Peel and quarter potatoes to equal size pieces. 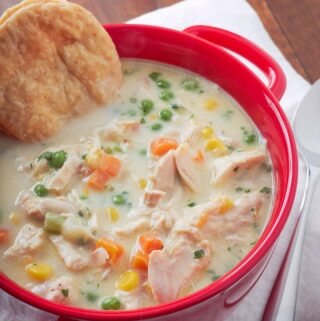 Transfer to a large bowl of cool water to wash off excess starch. 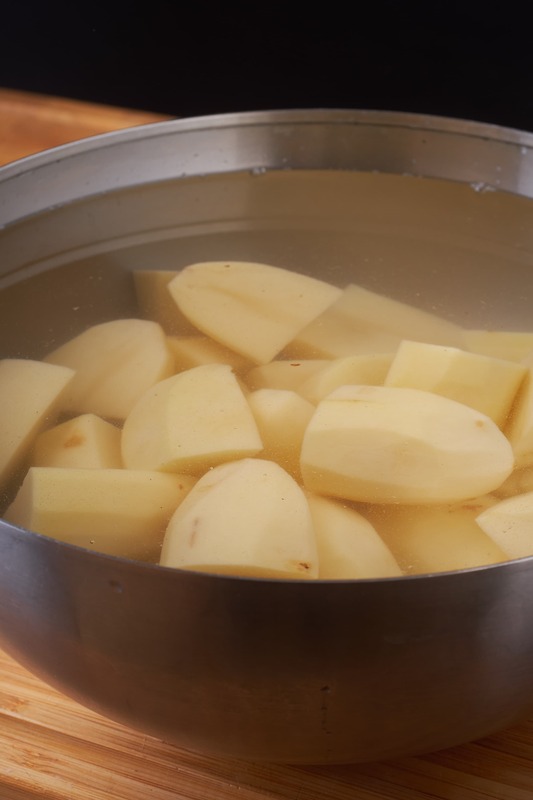 Add rinsed potatoes to a large pot along with 1 tablespoon kosher salt, Chicken Stock and Water. Heat over medium high heat and bring to a boil. Cook for 25-30 minutes until poking with a sharp knife causes the potato to fall apart. 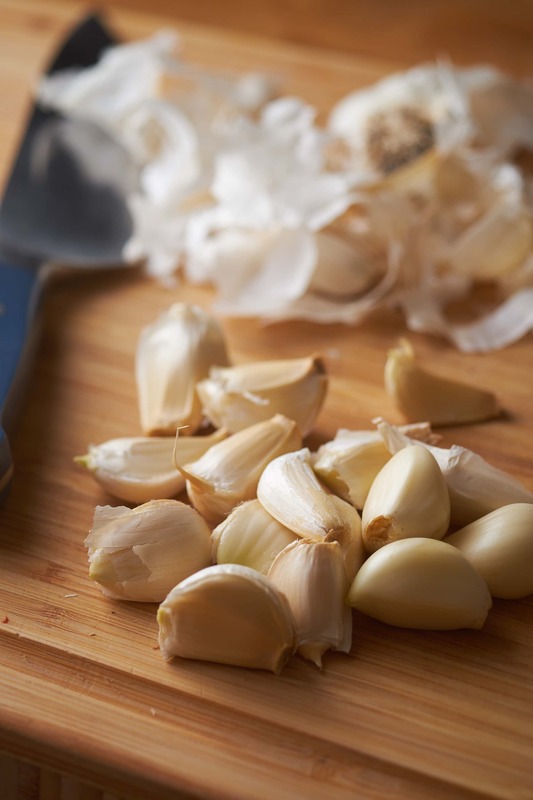 Smash and peel all the garlic. Add to a small pot with 1 1/2 cups olive oil. Slowly heat over a low flame for 20 minutes without browning the garlic. Reserve 2 cups of the cooking liquid discarding the rest as you drain potatoes. Rice the potatoes in to the emptied cooking pot using a potato ricer. Add the garlic infused olive oil and all the garlic. Use a whisk or wooden spoon to combine. Do not overwork the potatoes. Add the reserved cooking liquid. Whisk until smooth and fluffy. Season well with salt and pepper.